One of the very first makeup items that became a staple for me was eyeliner, more specifically, black eyeliner pencils. It was what I was known for in high school and I couldn't imagine going a day without it. As much as I loved rocking my eyeliner on both my top and bottom lids, I always ended up looking like a tired panda by the end of the day. No matter what I did, my eyeliner would smudge, fade and crease. Luckily we have many more eyeliner options in this day and age and we have a plethora of different colors, finishes and types of eyeliners to choose from. Would you believe me if I told you that Lancôme has released an eyeliner collection that offers more than just black, brown and navy liners? Not only that, but these eyeliners are legit. They are intensely pigmented, buttery-smooth, incredibly long-lasting and completely smudge-proof. Lancôme has been a brand loved by many and for god reason, but has been known as a brand that offered more toned down makeup and geared towards more mature consumers. These eyeliners are a total game changer for Lancôme and eyeliners as a whole! Available in 16 gorgeous shades in varying finishes (matte, shimmer and metallic). These liners are fragrane-free, paraben-free and sulfate free. What sets these liners apart from other on the market is that they have the intensity of a liquid liner but in a pencil form which is so easy to use and makes it great for beginners. They are so creamy and easy to blend (but you need to do it quickly because these bad boys set pretty fast and once they do they do not budge). 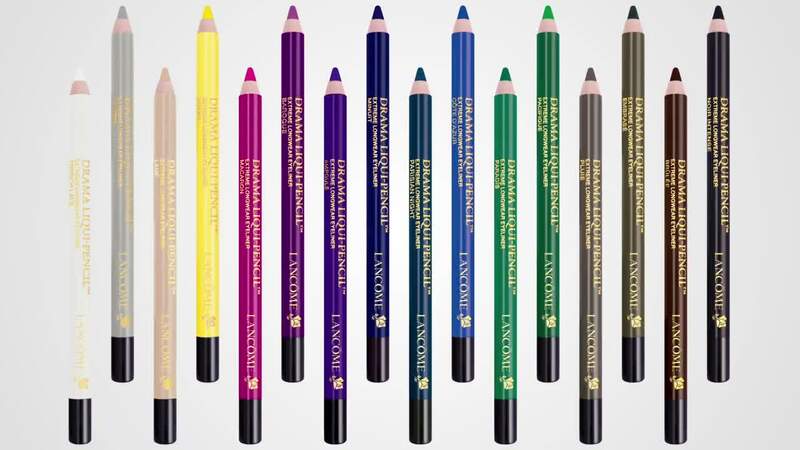 Lancôme claims that these wear for 24 hours and although I personally haven't tested that claim, I seriously do not doubt it because I have never ever tried a pencil that stays on as long as these do. When I first received these in the mail and swatched them, I had stains left over for a few days so I definitely recommend using an oil-based makeup remover to get these off completely. I only have two small problems with these eyeliners. The first is that since they are so soft and creamy, the actual product itself breaks off if you use too much force and no matter how much I sharpened them, I could never get them to a sharp point and I would have a lot of product built up in the sharpening blades, which equals wasted product. It's more of a slight annoyance than I problem I guess, because they are still usable and I sometimes even use a small precision brush to apply them. The second one is that no matter what I did, these do not transfer or stay on my waterline! Maybe these are meant to only go on the skin though which is where they obviously perform exceptionally well. From left to right: Macaron, Soleil, Pacifique, Paradís, Côte D'azur, Parisian Night, Minuit, Ampoulé, Baroque, Brûlée, Embrase, Pluie, Lamé, French Lace, Lumiére and Noir Intense. I filmed this quick little video to show you just how incredible smudge-proof these eyeliners are. I am rubbing HARD and even after all that rubbing, they do not lose their vibrancy and even the shimmer stays on. Color me impressed! 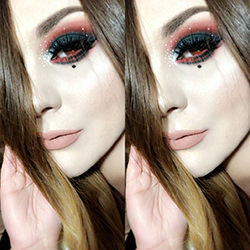 I wanted to create a Halloween look that could be done with only eyeliner so I decided to create a masquerade-style lace mask. I used various reference photos of lace masks and took inspiration from various ones and I just followed along and created this design. You can make it as intricate or as simple as you'd like! The Lancôme Liqui-Pencils are the perfect product for a Halloween look like this because it will stay put all night long and you don't need to worry whatsoever about it going anywhere! Also, I have to add that these liners are totally comfortable to wear and they do not irritate my sensitive eyes at all. They are ophthalmologist-tested so they should be safe for contact wearers as well. 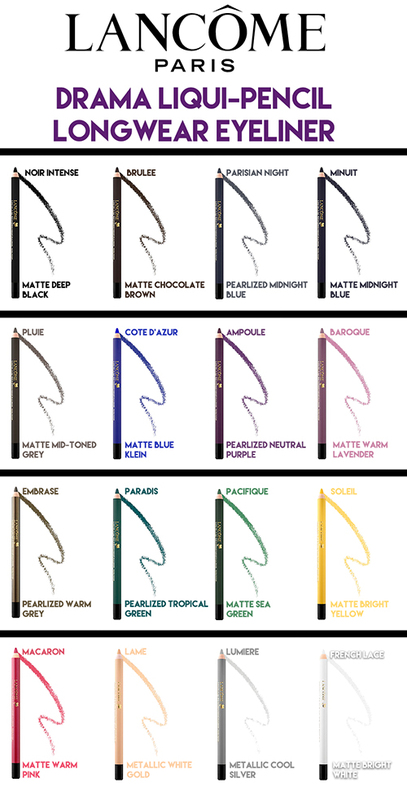 If you are interested in these amazing eyeliners, they are sold exclusively at Sephora in stores and online and retail for $23 USD each. There are so many different colors and finishes that you are bound to find a few that you like. I am obsessed with these and I hope Lancôme releases more color in the near future!